Take your kitchen to the next level with the TopZero Venice Sink. The Venice Sink is made of 304 stainless steel and coated with aluminum. You’ll love the soft, stain finish of this beautiful kitchen sink. This stainless steel, double sink comes equipped with premium, sound absorbing pads. Do you want to take your kitchen to the next level? 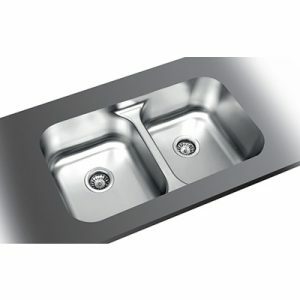 If so, there’s no better way to do so than by enhancing it with this beautiful, stainless steel, double sink from TopZero. Since this is a TopZero sink, it’s rimless, like all TopZero sinks. The rimless design eliminates the buildup of grime and scum, and it’s the perfect, modern touch for any kitchen. Featuring premium sound absorbing pads on the exterior of this sink, this kitchen sink is designed for people looking to create quiet, serene kitchens in their homes.